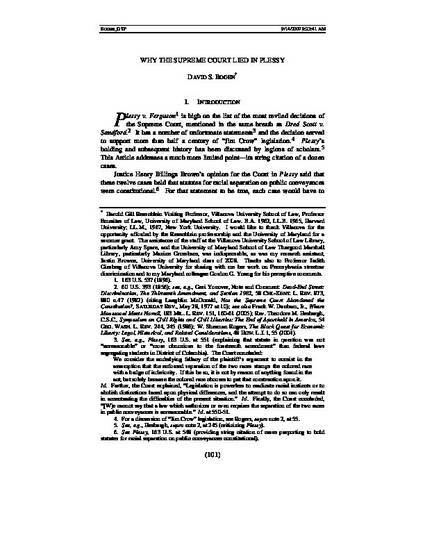 This article examines the citation in Plessy of a dozen cases that the Court said held racial segregation statutes in transport to be constitutional. It argues that none of those twelve cases upheld a segregation statute, but were largely decisions upholding decisions by the carrier under the common law. Justice Brown knew that the cases did not uphold segregation statutes, but he went ahead and used them to bury opposition under the weight of precedent. He knew that he was unlikely to be challenged, and he believed that the common law and the Constitution involved the same principles. The conflation of common law and constitutional provision was possible because the Court had shifted focus in the fourteenth amendment from the privileges and immunities clause to the equal protection clause. But the standards appropriate for governing private behavior may be quite different than those restraining the government, and that message is relevant today. 52 Villanova Law Review 101 (2007).